On behalf of Board, thank you for choosing to support Westchester County Crime Stoppers by making a donation. Your contribution is an investment in the security of our County of Westchester. For our 5th Anniversary Awards Dinner, we highly recommend payment for tickets electronically here to facilitate seating. Table Reservation $1,500.00 Please indicate the name for whom the table reservation is being made. Individual Reservation $200.00 Please indicate the name for whom the individual reservation is being made. Purchase a Bumper Sticker: $50.00 NOTE: Bumper Stickers are no longer a stock item and must be ordered. If you choose to make an online donation below, or send a check, specify the program to be funded. (e.g., Gun buyback or Bumper Sticker or General Fund). NOTE: All donations are tax deductible. 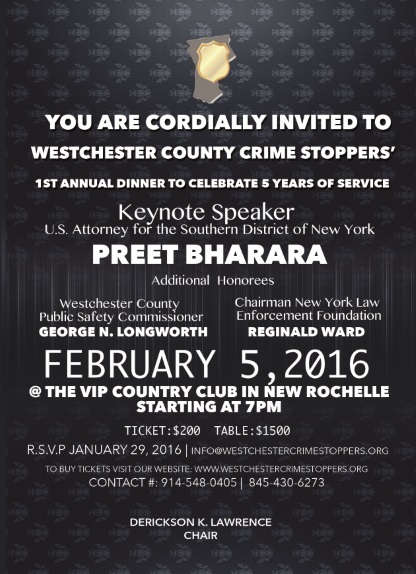 Westchester County Crime Stoppers, Inc.
Make your checks payable to: Westchester County Crime Stoppers, Inc.